Kubota’s L47TLB is one machine built to do the work of three. With Tier 4 Final 47.1 gross HP, 2,848 lbs. of lift capacity and 121 in. max digging depth, this compact, high-performance tractor/loader/backhoe model is ideal for independent contractors, landscapers, rental services and anyone looking to add power, speed and efficiency to their worksite. 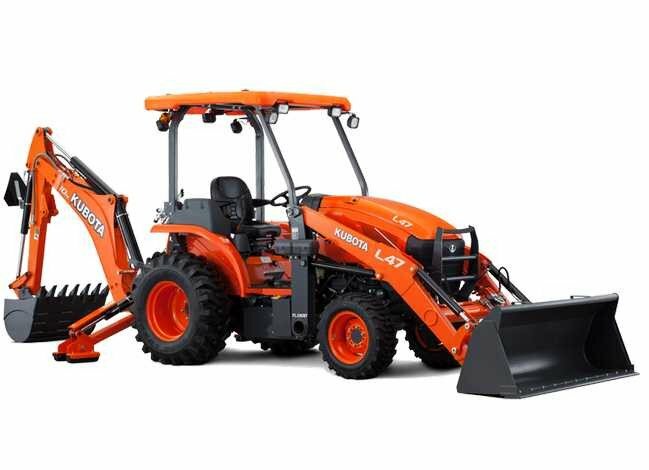 Powerful yet clean, Kubota’s new engines feature a Common Rail direct-injection system that reduces emissions and increases fuel economy while maintaining high levels of power and torque. These reliable engines also boast a Diesel Particulate Filter (DPF) and Exhaust Gas Recirculation system (EGR). Put it all together and you get greater fuel savings as well as compliance with Tier IV Final emissions regulations. Tackle any task with ease and efficiency. With extraordinary precision, HST Plus’s automated control of both the HST pump and drive motor gives you optimal performance, regardless of the task, working conditions, or operator expertise. Our HST also comes with a smoother, more responsive pedal, thanks to Kubota’s traditional hydraulic servo system, which decreases the amount of pressure required to depress the pedal. The L47’s four-wheel drive gives you the power and stability you need, especially when pulling heavy loads or working on uneven terrain. The front wheel drive bevel gear assures that you always get a smooth and full power transfer. The L47’s distinctive slant nose hood design isn’t just for looks. This unique styling offers you a greater field of view, allowing you to see more of what’s in front of you. The L47’s integral main frame absorbs twisting loads during backhoe and loader opeation and will not transmit flex to the tractor chassis. This ensures the tractor’s structural integrity. The heavy-duty rear axle uses multiple wet-disc brakes for extended life and smooth stopping performance. Get even more work done by attaching a wide range of PTO-driven implements, including rotary tillers, post hole diggers, snow blowers and rear-mounted mowers. The 540 RPM PTO is hydraulic-independent, letting you engage and disengage the PTO without stopping the tractor. A large, 17.7 gal. (67 liter) fuel tank lets you get more work done between fueling stops. Less down-time for refueling means greater productivity and efficiency, particularly on those big tractor jobs. The 4-post Rollover Protective Structure and the Falling Objective Protective Structure come standard on the L47. To help keep you safe from any potential risks, a steel roof lies underneath the stylish orange canopy. The L47 offers three optional Remote Hydraulic Control Valves for a greater selection of hydraulically powered implements. For operators, this versatile system translates into a convenient and cost-efficient solution.